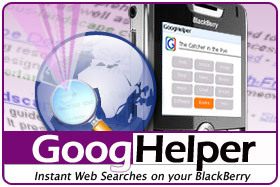 GoogHelper and Tipper Now Available for BlackBerry! Long time software developer iambic has finally entered the BlackBerry game with the release of GoogHelper and Tipper for BlackBerry. Iambic has been developing for pretty much every other smartphone platform to date, so its nice to see them finally giving us BlackBerry users some love. GoogHelper is a snappy utility that helps quickly launch various Internet searches using mobile friendly sites such as Google, Yahoo!Finance, Amazon, Wikipedia and many more. It has an intuitive, space efficient and elegantly designed interface, packed with enough power to search 12 different categories. 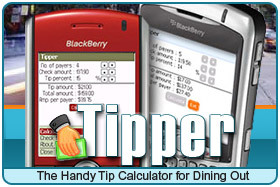 Tipper is a split tip calculator which comes extremely handy when dining out by saving time and effort by calculating the total and displaying the actual tip amount. Until today available for Palm OS and Windows Mobile, and now also for BlackBerry. Both apps ring in at $4.95, and are available for download (free trial available) at our ShopCrackBerry.com Software Store. I've downloaded GoogHelper and have been loving it - definite value proposition in terms of being a time saver. With GoogHelper, you simply open the app, type in your query, then click which source to select (Google, Wikipedia, Image search, etc.) and the results get displayed. It's FAST. You can accomplish the same thing using a web browser, but it takes so much longer in practice - open browser, go to google, wait for google to load, type in query, click search, wait for results to load. If your search isn't on your homepage and you want to search a specific part of a site (or even if it's bookmarked) you still have way more clicks and a lot more time wasted loading compared to GoogHelper. Give it a try - it's simple, but effective. Look more iambic titles in our software store in the near future... next on the agenda is EzQuote, which is a simple and fast portfolio tracking application for your BlackBerry. Welcome to the Wonderful World of BlackBerry iambic!